Surely our Australian veterans deserve better than to be treated like second-class citizens by their own Government run superannuation fund? Yes, the Commonwealth Superannuation Corporation - (CSC) needs to be investigated by an extended and more powerful banking and financial sector Royal Commission. Currently, CSC is excluded from being investigated because it is a Commonwealth Identity - protected by the Clayton's RC TOR. Comsuper is the only Superfund not included in the Royal Commission. CSC invalidity payments can be stopped (no guarantee) therefore not a lifetime pension. (Their own annual report says that invalidity benefits are not lifetime yet they argue they are lifetime in court). This leads to over taxation and compensation splitting in the courts. No regulatory authority has rigorously tested or questioned the standards of conduct, governance or corporate culture of the CSC. An ex-spouse can receive a LIFETIME associate pension and can work and contribute to their own super while a veteran can lose theirs while their ex-spouses’ payments are unaffected – for life! The accumulative effects of CSC and DVA errors are a factor in the decline of veteran health, well being and suicide issues. Why should injured Veterans have fewer rights than other Australians from other careers? 11,000 defence people receive payments, and up to 1000 more are required to start on benefits each year, so the Royal Commission should investigate the issue for the sake of these defence personnel. 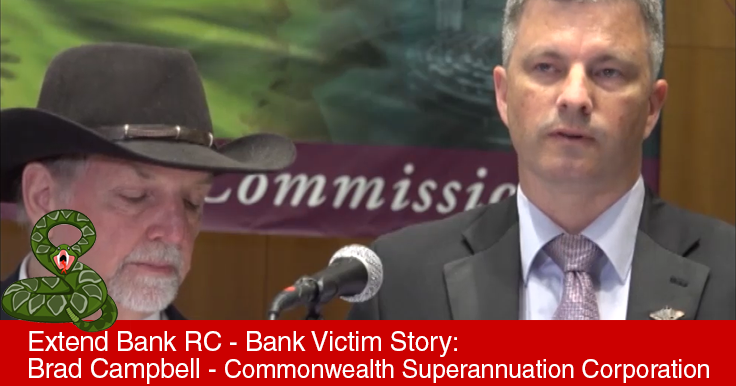 Why Comsuper (CSC) needs to be investigated in the Royal Commission. LA: Brad, you are one of Australia's 11 thousand injured veterans who is paid a Comsuper invalid benefit. Do you understand why the royal commission is looking at every other Super Fund except CSC? BC: It is probably so it does not embarrass the Government. LA: The government says Comsuper is heavily regulated and open to parliamentary scrutiny. Is that the case? BC: Heavily regulated no, no agency has looked at our issues seriously. Parliamentary scrutiny, while available, is avoided. LA: Did you challenge one issue in court? BC: Yes, I was forced to the Federal court where I represented myself and won. LA: What did Comsuper do? BC: They ignored the court findings and continued to do the same thing. They did this knowing that they would be covered by retrospective legislation designed to circumvent the court's findings. LA: What is the main issue here? BC: Comsuper report a payment that can cease as a lifetime pension. BC: No it says so in their legislation, trust deed and their own annual report. LA: What are the consequences of this double standard? BC: It leads to injured veterans compensation payments being overtaxed and over valued in the family courts. LA: What did Mark Bishop former Labor Senator have to say about Comsuper? BC: He chaired the senate enquiry into the Commonwealth bank that led to the Royal Commission. He said the fund makes the banks look like angels. LA: Is it unfair Comsuper is left out of the royal commission? BC: Yes, there are 700,000 members of the public service that have been denied the rights of every other Australian. We just want to know our super is being managed at a level the community expects. A veteran (from Latin vetus, meaning "old") is a person who has had long service or experience in a particular occupation or field. A military veteran is a person who has served and is no longer serving in the armed forces. Surely our Aussie veterans deserve better than to be treated like second class citizens by their own Government run superannuation fund? Yes, the Commonwealth Superannuation Corporation - (CSC) needs to be investigated by an extended and more powerful banking and financial sector Royal Commission. "No-one wants to investigate themselves"
The cliche of "barely scratching the surface" doesn't even fit with summarising the super hearings at #BankingRC. One of Australia's largest funds was specifically excluded. "So 10 per cent of the population no longer have that right as every other Australian, to know that their superannuation is being managed in accordance with the law and in a manner that exceeds or is at a level that the public expects?" he asked. Mr Campbell met Prime Minister Malcolm Turnbull and asked him, in person, why the royal commission's terms of reference specifically exclude the corporation. Treasurer Scott Morrison responded for Mr Turnbull. In a letter, he told Mr Campbell "it is a statutory government agency operating under higher standards". "I'll be bold enough to say it's a government entity — it's like the fox investigating the henhouse massacre!" he said. "No-one wants to investigate themselves." From - ABC Article "Banking royal commission: Superannuation hearings go from the dispiriting to the galling"